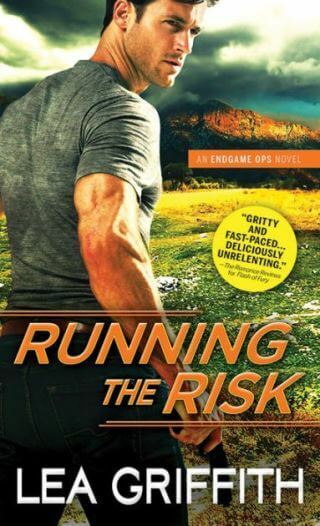 I thought the first book in this series was amazing, but RUNNING THE RISK just blew that assessment out of the water and in my opinion, has cemented Lea Griffith’s status as a rock-star in the romantic suspense genre! This is exactly what I want to read when I pick up a book in this genre: non-stop, explosive action, edge of your seat suspense and an undying love story all wrapped on in one. Jude Dagan’s life ended the moment he watched the only woman he ever loved die in a mission gone wrong and for the past year he’s been going through the motions, only to discover that she not only lived, but willingly walked away. She’s always been his number one priority and he’s ready to blow up his mission, to keep her safe in spite of her lies and deception. Ella Banning gave up her life and freedom for pain and torture in the service of love and country, but now that Jude knows she’s alive, she needs to stay a step ahead of him to ensure that the mission she gave up so much for is completed. But with the smart and well connected foe they are facing off against, joining forces may be a better option. The multilayered plot of this story makes it hard to separate the characters into good and bad categories, and other that the Endgame team itself, everyone else is suspect. Their motives, their goals and their methods are all questionable, especially as people who were thought to be dead are really not and we are getting tiny pieces of the picture that point to a massive high stakes plot that is sure to rock the very foundations of the world as we know it, once the full extent of it is revealed. Ella and Jude’s love for each other is undying and would be a tad melodramatic, except for the fact that the pace of the story itself is frenzied and fast, and the shadowy forces they are up against seem more like fiction than reality. I really am excited about this series in a way haven’t been about any other in the last year and I can’t wait to see what Ms. Griffith has in store next. RUNNING THE RISK can be read as a stand-alone, but with the overarching plot, I would recommend starting with the novella that introduced the series and reading in order.